In 2014, Sacramento Republic FC set the bar for every expansion franchise that would follow in its footsteps. The club finished its inaugural regular season with a 17-4-7 mark – just seven points off the pace of table toppers Orlando City SC – and went on to claim the USL Cup with a 2-0 victory over Penn FC. Oh, and did I mention they broke the league’s attendance record in the process? Such immediate success both on and off the field has been impossible for expansion franchises to replicate in the four seasons since. Yes, Louisville City FC has finished second or better in the Eastern Conference each of those four years and won the past two USL Cups, but the club didn’t reach the league’s pinnacle until its third season. There’s a difference between immediate and sustained success. As the calendar flips to 2019, the upcoming Championship season comes closer into view and with it comes seven more opportunities for expansion franchises to make their mark. Austin Bold FC, Birmingham Legion FC, El Paso Locomotive FC, Hartford Athletic, Memphis 901 FC, Loudoun United FC and New Mexico United join the league with the lofty goal of replicating Sacramento’s success in year one. While each franchise has plenty to be excited about, I believe the club with the best chance of replicating that level of success is New Mexico United. 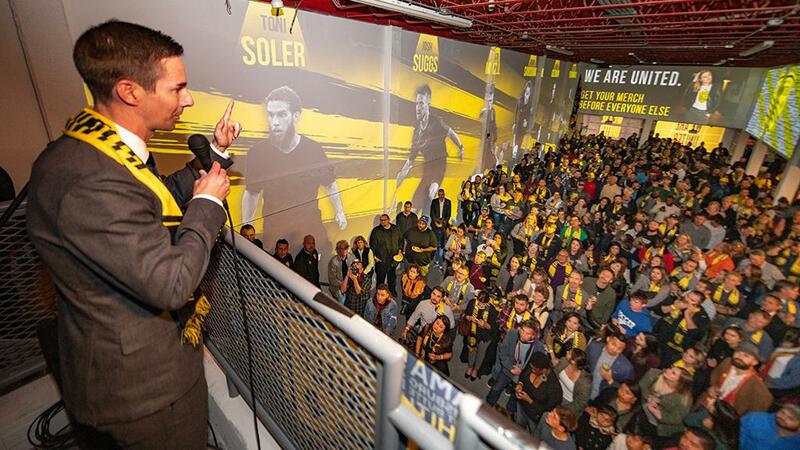 Owner Peter Trevisani and his staff have already begun building a fanbase in a largely untapped sporting market and Head Coach and Technical Director Troy Lesesne has started putting together a team that looks prime to compete in the Western Conference. New Mexico’s inaugural roster, which currently sits at 14 players, already boasts an impressive balance of Championship experience, veteran leadership and young attacking talent. The club has already signed 10 players that played in the Championship last season, seven of which made 20 or more appearances for their previous teams. That cumulative experience should help New Mexico hit the ground running in 2019, especially given the blueprint laid out by Sacramento in its inaugural season. Midfielder Rodrigo Lopez, who joined Republic FC from Orange County SC as the club’s first signing, led the team with 13 goals and 10 assists across the regular season and USL Cup Playoffs in 2014, while defender Mickey Daly, who spent the previous season with Wilmington Hammerheads FC, spearheaded the team’s defense on its way to winning the USL Cup. Not only do most of United’s signings offer a wealth of Championship experience, but a few bring a leadership background to New Mexico as well. Defender Josh Suggs, a native New Mexican, served as the captain of Colorado Springs Switchbacks FC last season, while midfielder Juan Guzman wore the armband for OKC Energy FC each of the past two years. The pair – as well as 30-year-old forward David Estrada – give Lesesne a veteran core that he can rely on to help implement his ideas. As a first-time Head Coach, having that group of players to lean on should be a comfort to Lesesne as he makes the jump after spending the past 14 years as an assistant. He can also take some comfort in knowing that you don’t have to be an experienced Head Coach to have success with an expansion franchise. In July 2013, Republic FC hired Preki to oversee the team’s inaugural season after a failed stint with MLS side Toronto FC and nearly three years away from management. None of that seemed to matter as Serbian guided Sacramento to the league’s summit in his first season at the helm. Lesesne should also benefit from the young attacking talent he has at his disposal. Players like Kevaughn Frater and Santi Moar will be a welcome sight after spending the past four seasons with the Charlotte Independence, whose top scorer in 2018 was 38-year-old Jorge Herrera. The 24-year-old Frater offers plenty of pace and will look to stretch opposing defenses, while the 25-year-old Moar led all Bethlehem Steel FC players with nine assists and 51 chances created in 2018, helping the team reach the postseason for the second straight season. With the USL Cup Playoffs set to expand to 10 teams per conference in 2019, New Mexico United should have no trouble reaching the postseason in its inaugural campaign. Given the balance of talent described above, as well as other key pieces in place like goalkeeper Cody Mizell, defender Austin Yearwood and forward Devon Sandoval, I expect the club to be able to steer clear of the Play-In Round by finishing in the top six of the Western Conference. However, since the Championship now boasts 36 teams – 22 more than it did in 2014 – the odds are more stacked than ever against New Mexico to replicate Republic FC’s success and bring home the USL Cup in its inaugural season. While the chances may be slimmer, there’s little doubt in my mind that United is currently in the best position of the seven expansion clubs to succeed in 2019 and beyond.